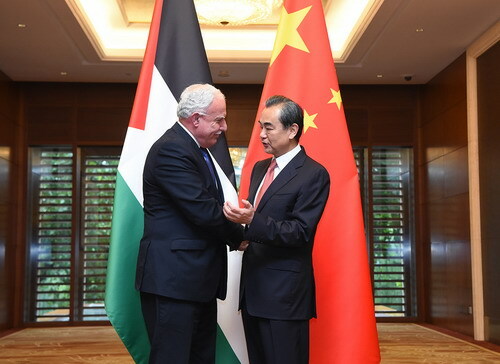 On July 11, 2018, State Councilor and Foreign Minister Wang Yi held talks in Beijing with Foreign Minister Riyad al-Maliki of Palestine who was in China for the 8th Ministerial Meeting of the China-Arab States Cooperation Forum (CASCF). Wang Yi expressed that President Xi Jinping delivered an important speech at the opening ceremony of the 8th CASCF Ministerial Meeting yesterday, during which President Xi Jinping reiterated China's firm stance on the Palestinian issue and announced China's new measures to assist the Palestinian people. This year marks the 30th anniversary of the establishment of diplomatic relations between China and Palestine. China is willing to take it as an opportunity to promote bilateral relations for greater development. Wang Yi pointed out that China will continue to firmly support the just cause of the Palestinian people to restore their legitimate national rights. The Palestinian issue should not and will not be marginalized. Palestine's rights to self-determination cannot be traded, nor its pursuit of establishing an independent state as well as its principles and dignity. China is willing to, together with the international community, continue to make its own efforts to advance the just cause of Palestine. Riyad al-Maliki noted that Palestine warmly congratulated on the complete success of the 8th CASCF Ministerial Meeting, highly appreciated President Xi Jinping's far-reaching speech at the opening ceremony, and fully agreed on President Xi Jinping's proposal of establishing Arab States-China strategic partnership and forging a community with a shared future for Arab States and China. Actively supporting the Belt and Road Initiative put forward by President Xi Jinping, Palestine stands ready to deepen practical cooperation with China under this framework. China, a peace-loving country that stands for justice, has always adhered to a just position on the Middle East issue, especially the Palestinian issue. The Palestinian side expects China to play a greater role in promoting the resumption of the peace process in the Middle East at an early date and the realization of the two-state solution. The Palestinian side thanks China for its long-term selfless assistance to Palestine, and the Palestinian people will remember that.